Cost and complexity have often limited decoder technology to higher-end systems. 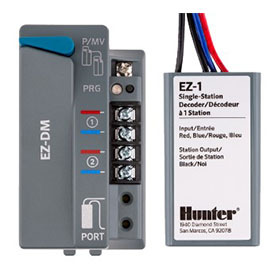 With the revolutionary EZ Decoder System (EZDS) from Hunter Industries, your clients get all the advantages of two-wire installations with simple, cost-effective technology. EZDS is compatible with all the features of our Hydrawise™-enabled HCC controller, as well as the ICC2 controller with new Centralus™ central control software currently in open beta. Plug in the EZ-DM two-wire output module to enable up to 54 stations of irrigation, plus a master valve, on a single pair of wires. Then simply place EZ Decoders at each valve.